A United Launch Alliance Atlas 5 rocket blasts off from Space Launch Complex-41 at the Cape Canaveral Air Force Station in Florida with the Air Force's Space Based Infrared Systems (SBIRS) GEO-1 satellite on May 7, 2011. Liftoff occurred at 2:10 p.m. EDT. CAPE CANAVERAL, Fla. -- A new U.S. military satellite launched into orbit Saturday (May 7) on a mission to enhance the country's missile defense and detection capabilities. The satellite blasted off atop an unmanned Atlas 5 rocket from a seaside pad here at the Cape Canaveral Air Force Station at 2:10 p.m. EDT (1810 GMT). The mission had been delayed one day due to bad weather. The Atlas 5 rocket carried the first satellite in the U.S. military's planned four-satellite Space Based Infrared System (SBIRS). The satellites, the first of which is called GEO-1, will replace the military's Defense Support Program satellites that are currently in orbit. The rocket launch provider United Launch Alliance (ULA) oversaw Saturday's successful liftoff. The GEO-1 satellite rode atop an Atlas 5 configuration that did not use solid rocket boosters. 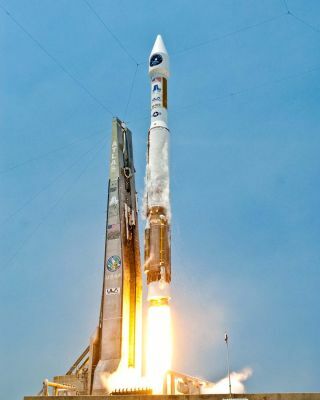 The U.S. military's new GEO-1 satellite blasts off atop an Atlas 5 rocket on May 7, 2011 in a launch from Cape Canaveral Air Force Station, Fla., The satellite is the first segment of the Space Based Infrared System (SBIRS), which will replace the Defense Support Program currently in orbit. The $1.3 billion GEO-1 satellite is expected to provide the military with advanced warning of potential incoming threats while they are on the battlefield. It will circle the Earth in a geosynchronous orbit about 22,000 miles (35,406 kilometers) above its coverage area. "It's a great day for United Launch Alliance, we have been entrusted to launch the most important missions for this country - be it for NASA, the military or for the private sector," said ULA spokesman Chris Chavez. "This is our 50th launch overall, our 26th using the Atlas 5 launch vehicle and our fifth launch this year already." This new satellite will give betterearly warning of incoming missiles. GEO-1 will also provide related information such as intelligence-gathering, missile defense and situational awareness for military personnel. "SBIRS GEO-1 represents the dawn of a new era in overhead persistent infrared surveillance that will greatly improve our national security for years to come," said Brig. Gen. (select) Roger W. Teague, the U.S. Air Force's Infrared Space Systems Directorate director, in a statement. The satellite can track multiple areas and potential threats at once as opposed to the system currently in orbit. The satellite utilizes heat-sensitive technology to perform its mission and has an expected design life of about 12 years. "This launch represents the culmination of hard work and dedication from an elite team of individuals," said Michael Friedman a spokesman for Lockheed-Martin, which built the satellite. "Together we've built and launched a spacecraft that will protect citizens for years to come a spacecraft the U.S. Air Force and Lockheed Martin SBIRS team knows the nation will be very proud of." A United Launch Alliance Atlas 5 rocket thunders off of Cape Canaveral Air Force Station's Space launch Complex 41 at 2:10 p.m. EDT carrying a sophisticated missile detection satellite, GEO-1, for the SBIRS system. GEO-1 will compare the heat signature of potential targets (in this case the heat from a missile's exhaust) against the ambient background temperature and relay its observations to its control team. The launch had been originally schedule to take place on Friday, but intermittent rain and cumulous clouds thwarted the attempt. Weather was not a concern at the time of launch with completely clear skies in the Cape Canaveral area. "The Atlas 5 has a 100 percent success rate, we simply cannot ask more from this launch vehicle,” said U.S. Air Force spokeswoman Glorimar Rodriguez. “This mission was number 26 for the Atlas 5 rocket; again and again the launch vehicle performs flawlessly."